None of this is normal—even for Crook County where I was an Assistant State’s Attorney. Educated guess: this hoax implicated someone very important who had pull with the State’s Attorney, and who very badly did not want to be implicated. 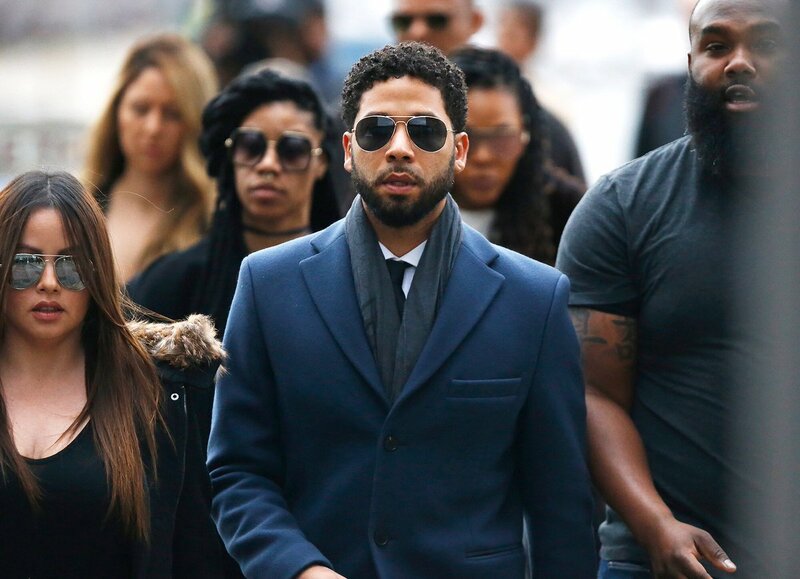 “Chicago’s police union has demanded an investigation into Cook County State’s Attorney Kim Foxx her text messages with Jussie Smollett’s family friends. Before recusing herself from the case in mid-February, Foxx exchanged texts with Michelle Obama’s former chief of staff, Tina Tchen, a close friend of the Smollett family. “Jussie Smollettlogged a total of 18 hours of community service over 2 days — with Jesse Jackson‘s organization, the Rainbow PUSH Coalition — and that was enough to satisfy prosecutors in Chicago. Honchos at Rainbow PUSH — a civil and human rights organization — tell us, Jussie volunteered for the first time Saturday, putting in 8 hours from 10 AM to 6 PM. He just completed another 10 hours on Monday. A key fact in the initial reporting was Smollett’s allegation of being attacked centered on his attackers being MAGA hat-wearing thugs, which turned this story into another massive media anti-Trump spin effort. Don’t know about this case implicating “someone very important” specifically, but obviously Smollett has connections to some pretty powerful Chicago political players… with a former Obama aide and Jesse Jackson going to bat for Smollett. This Smollett, dare I use the term, “narrative” smells so much like other Dem SPIN narratives meant to smear Trump and his supporters, that one wonder if Smollett wrote this script alone or if he was collaborating with some professional Dem SPIN writers? “Sources said the brothers are now cooperating with police. Smollett has said two men attacked him while he was walking home around 2 a.m. on Jan. 29. He claimed they yelled racial and homophobic slurs at him, beat him, poured a chemical on him and put a rope around his neck. Sources told CBS 2 News that Smollett paid the two men $3,500 to stage the attack in Streeterville. The brothers, seen on surveillance video near the scene of the alleged attack, told investigators Smollett directed them to buy the rope used in the incident, and paid for the purchase at Crafty Beaver Hardware Store in Ravenswood days before the incident. The brothers, who were questioned by police last week before being released, were paid $3,500 before leaving for Nigeria and were promised an additional $500 upon their return. There was a rehearsal, professional actor, stage props purchased days before the attack, which makes one wonder if Smollett wrote this script alone or if he had assistance? Was Smollett the sole creator of this MAGA SPIN hoax or was he just the actor recruited to play the lead role? Here’s a short read by Peter Kirsanow, in The Corner section at National Review, titled, “Ask Obama”. “The mainstream media remain invincibly incurious regarding the former president’s role in the Russia affair. Presumably, underlings in Obama’s national-security apparatus were running about obtaining FISA warrants, leaking, unmasking, and spying on a presidential campaign and transition without the former president’s involvement, let alone direction. He remained oblivious despite Lisa Page’s September 2, 2016 text to Peter Strzok that “potus wants to know everything we’re doing.” Everything? There was a heckuva lot going on. Definitely plenty of questions about the Steele dossier swirling since the Mueller report was handed to the attorney general. Andrew McCarthy at National Review provided the best legal analysis of the entire Russian collusion mess for the past two years and JK kindly provided a podcast link, located here, where McCarthy discusses the latest news on the Mueller report findings. It’s worth your time to listen to this, almost hour-long, discussion. Space abhors a vacuum… so in lieu of any facts about what the Mueller report actually says, the media, partisans and the punditry “smart” set have talked themselves into extraordinary spin contortions, since news broke Friday that the Mueller report is finished. In the political media cart before the horse fashion, by the time we learn actual details, the media spin fronts have already staked out their talking points. The Dem spin pivot is it’s now all about the SDNY, according to Adam Schiff, while Trump spin is working to cast Trump as a sainted martyr. The truth remains, regardless of Mueller’s report, that both 2016 campaigns were extremely corrupt and working to acquire Russian dirt on their opponent. While that isn’t criminal, it speaks to both Trump and Hillary being thoroughly corrupt and willing to do anything to win. That fact should disturb every American. All along I’ve contended that the Russians would not want to openly “collude” with either campaign, because that would require the Russians having some level of “trust” in those American political operatives and besides, why should the Russians “collude” with American political operatives, when they can feed tantalizing bits of partisan disinformation into the American media and keep the American partisans attacking each other? Now, the quest to uncover the Clinton/Russian collusion will begin, as the focus shifts to trying to uncover how the Steele dossier came about and how on earth the FBI, DOJ and top Obama intel peeps bought into it so completely. Fun times as the 2016 SPIN information war drags on and on and on. 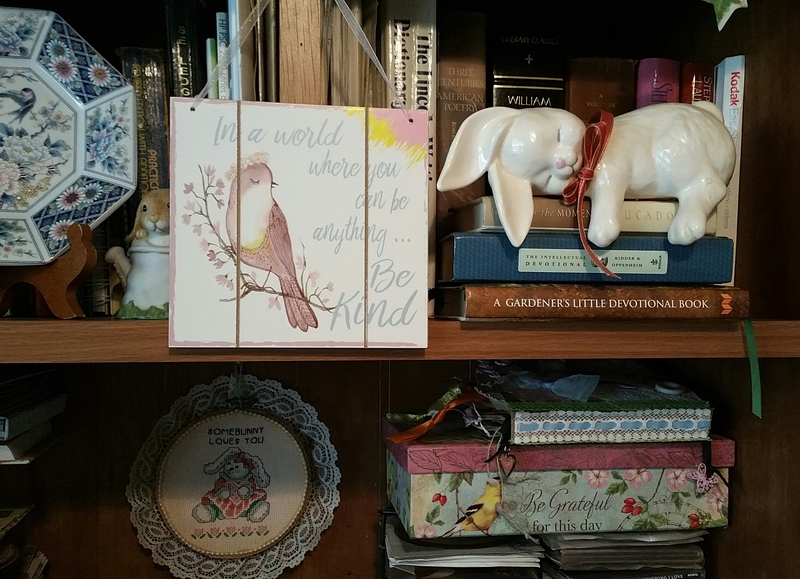 I like cutesy pictures and saccharin sweet sayings, so here’s what I look at on the hutch above my PC. “Human beings have a deep longing to live together in harmony. People only feel completely alive when experiencing loving bonds with one another. Everyone, of all faiths and no faith, knows this truth, and most profess it openly. As I am typing this, Twitter is aflutter with another Trump-generated outrage spin cycle about Trump’s vicious attack yesterday on the late senator, John McCain, while standing in front of Army tanks and the American flag. This spin cycle will agitate for a few days, but nothing will really change, despite a firestorm of words flying in the media, covering this latest Trump spin blitz. Our politics very much reflects our culture and despite many anti-Trump politicians and pundits asserting, “This (meaning Trump) is not who we are,” sadly, Trump very much reflects who we are. The truth is, in an America where good character and being truthful matters, neither of our two thoroughly corrupt 2016 presidential contenders would have been their party’s choice. If either party had any ethical standards, they would have rejected such completely mendacious candidates, who were under so heavy a cloud of corruption, and who both have glaring character flaws. We embrace a culture dominated by social media celebrity, Reality TV stardom and a news media entrenched in promoting political spin cycles. Absent this media dominated culture, neither Trump nor Hillary would have risen to the top and diligent investigative reporting in the news media would have sunk both of them. You don’t need a degree in psychology or fancy clinical terms to see that both Trump and Hillary lie outrageously and they both have the disturbing habit of doubling down on their lies, even when there’s video of them saying or doing the exact thing they are denying. They launch media spin campaigns to bolster their lies rather than admit they lied. That speaks to our American culture, where too many people prefer to jump on the latest popular spin train rather than standing up for any sort of moral principles. Many conservatives and NeverTrumpers made their peace with Trump as POTUS, happily consoling themselves with “But Gorsuch” type rationalizations and trying to skim past the recurring Trump-instigated outrage spin cycles, like this bizarre spectacle of Trump’s attack on McCain yesterday. Likewise, many Democrats chose to ignore the obvious Clinton corruption. How many Americans will choose to start being kind and generous when facing hostile attacks? Well, judging from a couple of decades of watching… and experiencing, social media behavior, even a few people beginning to lead this “kill them with kindness” approach, assuredly, is a welcome glimmer of hope. The Dalai Lama and Brooks “Kill Them With Kindness” plan, naturally, resonated with me, because it’s the only way to defeat the massive SPIN information war that drives, not only American media, but also American culture. Since 1998, I’ve wished a thousand times, and more, that I had never posted any comments online, but perhaps working toward writing less about politics and more about things that matter much more to me might be a good thing. Sometimes all it takes is a small gesture to change the tone, so I welcome the Dalai Lama and Brooks suggestion and will work to try to change the only person I can control… myself (and the tone of my blog & social media comments).